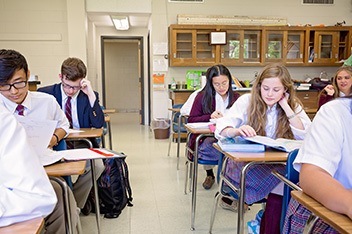 Heir to the time-honored Benedictine tradition, Saint Bernard Preparatory School’s mission as a Catholic, college preparatory, residential school is the cultivation of a love of learning and a life of virtue in young men and women within a community of faith and scholarship. To instill a solid background in Christian teaching and practice and in the rights and responsibilities of being members of Christ’s Body the Church, of American society, and of the global community. To exemplify the Benedictine tradition of daily prayer and work. To train students to think well, to speak effectively, to listen discerningly, to read widely and deeply, and to write convincingly. To lay a foundation in communication, mathematical skills, and scientific concepts so that everyday experiences may be a springboard to enhance students’ growth, continuing education, and service to others. To provide experiences by which students may explore, understand, appreciate, and develop tolerance for racial, cultural, and socioeconomic differences. To help students establish patterns of lifelong spiritual, emotional, mental, and physical health. To present in a positive and healthy way, life-coping skills which address realistic questions, challenges, and problems that young people must encounter in our rapidly changing society. To encourage students to investigate career possibilities that a higher education may offer them. To expose students to aesthetic qualities through music, art, literature and other contemplative and creative media. To create a community environment for boarding students that nourishes personal growth through firm, consistent and nurturing residential policies. To assist students in developing skills for leadership in our society. To establish extracurricular programs that create a proper balance between competitive and recreational activities. To foster a kindred spirit among “Bernardians,” students and faculty alike.